Cae Gwyn offers glamping with a private hot tub in North Wales set within the grounds of a beautiful Georgian country house. 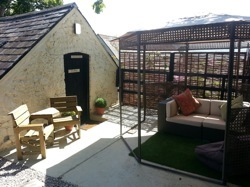 Recently restored, The Bothy offers stylish glamping accommodation, preserving the character of the lovely old building but also offering modern luxuries like central heating, free Wi-Fi and DVD (so you can snuggle up whatever the weather!). 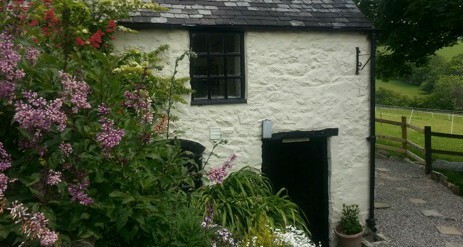 The Bothy was once-upon-a-time just a worker’s stone hut. 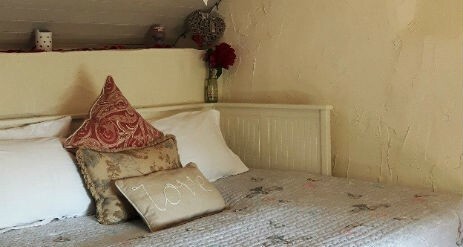 Now it is a chocolate box hideaway with its very own wood fired hot tub, luxury bathroom on the lower level (freestanding bath sound enticing?) and cute living space and super comfy bed on the upper level…together with BBQ area, outdoor fire and spectacular views. 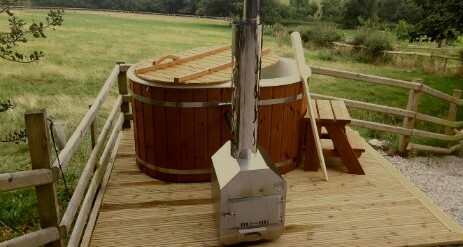 Exclusive use of Norwegian spruce hot tub – lovely tea tree essential oil included! 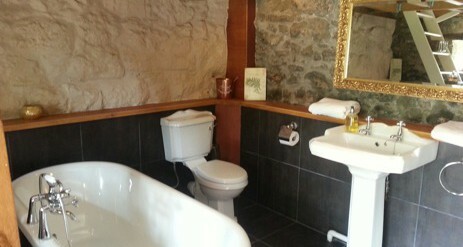 Luxurious bathroom on the lower level is all new, black slab tiles/stone walls with freestanding bath and open ‘bread oven’ with fire grate and lots of candles – very atmospheric! Kitchenette for prepping meals and late night hot chocolates! There is no internal stairway between the upper and lower levels, but we supply bathroom robes so you can comfortably wander the short path connecting the bathroom, bedroom and garden area. 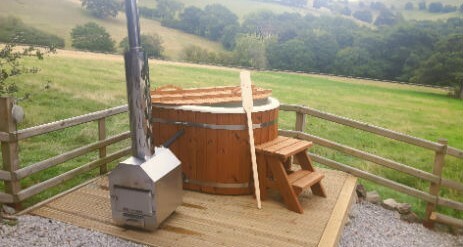 And sitting under the stars in your own private wood fired hot tub is not to be missed (for your use only!). We do the hard work and chop the wood, you just light up and stoke the firebox till you reach your preferred perfect temperature…and let the aroma of the burning wood carry you away to relaxation central! (Firewood for the firepit and the hot tub can be bought on-site at a friendly rate). 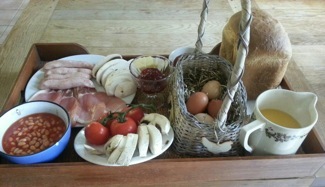 During the summer season, we can provide a hamper of full English breakfast ingredients – marvellous thick cut bacon (from Joe the local farm butcher) sausages, tomatoes, beans, free range eggs from a neighbouring farm…and our own home baked bread. Sit back and drink in the view of the beautiful surrounding hills, relax with a glass of wine at the picnic table while you prep your delicious BBQ, cuddle up and watch movies…or recline in the bath while your partner stokes up the hot tub. And if you feel like being a bit more active, use the information booklet we have prepared for you…it includes the best local restaurants, fun things to do, special sights that only locals know about….and even the gorgeous beach dedicated to St Dwynwen, the Welsh patron saint of lovers (voted by Conde Nast as one of the best beaches in Britain!). The Vale of Clwyd is an Area of Outstanding Natural Beauty and The Bothy sits within the grounds of a lovely Georgian country home, with magnificent views into the Vale and on to Snowdonia National Park beyond – yet central to so many of the things that North Wales and Cheshire have to offer: the stunning World Heritage site of Conwy, the sparkling Isle of Anglesey, Snowdonia National Park, the North Wales coast with its fine sandy beaches, the ancient walled City of Chester and even the UK’s largest designer shopping outlet! 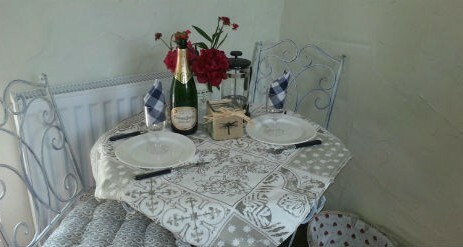 Is this Glamping or just a very romantic bijoux space for special friends? 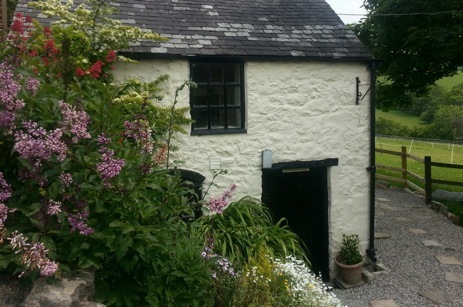 What it definitely is: a special place for a romantic weekend away, a marvellous spot to chill out, or a special treat if you are having an active weekend (lots of interesting cycling and walking in the area, and of course all the great North Wales attractions). 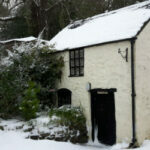 Why not book now and treat yourself to a few days relaxing, soaking, reading?